Speakers and sound bars by JBL, F&D, Bose and others are up for sale with a good discount during the Amazon Prime Day sale. There are also some considerable offers on headphones. Amazon’s Prime Day Sale has started and the online retailer is going all out with numerous deals and discounts across various categories. Audio accessories by manufacturers like Sony, F&D, JBL and others are on sale at a discounted price. Here are the deals you should consider. Sony’s premium WH1000XM2 wireless headphone (review) has received a flat Rs 7,000 discount. Not only the device sounds incredible, it is also packed with features and comes with good noise cancellation. Click here to buy. The older Bose QuietComfort 25 is a wired over the ear headphone that features active noise cancellation. It is not Bluetooth enabled but with the good audio performance and the hefty discount it has received, it is definitely worth considering. There are two variants of the Bose QC 25 and one is compatible with an Android device, while another one works with only iOS devices. Click here to buy. The Sennheiser HD 4.50 Wireless noise cancellation headphone is Bluetooth 4.0 and 'apt' technologies enabled. The "Noise Gard" active noise cancellation is said to reduce ambient noise levels for improving the listening experience and the device features ear-cup mounted controls for changing tracks and for making calls via the integrated microphone. The company claims that it can deliver up to 19 hours of battery life with both Bluetooth and Noise Gard activated. Click here to buy. The Sennheiser CX 180 comes with an in-ear design and rated impedance of 16 ohms. It features a sensitivity of 110 dB/mW and a frequency response between 20 Hz - 20000 Hz. Click here to buy. The boAt Rockerz 400 Bluetooth Headphone is being offered on Amazon with a 59% discount. Priced at Rs 1,299, the device sports an in-ear design and comes with integrated buttons for calls and music controls. It’s a good value for money device with great, well-balanced sound.Click here to buy. 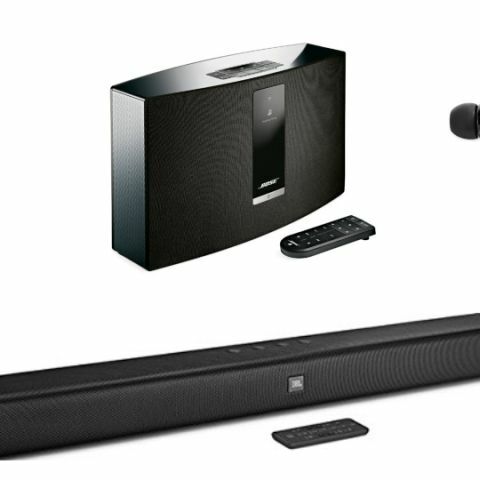 The Bose SoundTouch 20 Series III Wireless Music System connects to the home Wi-Fi and it also supports Bluetooth connectivity. It sports an OLED display, aux input, USB port and an ethernet port for connectivity. The device can directly access music streaming services like Spotify and Pandora, along with internet radio and pairs with the SoundTouch app to enable better audio control for the user. Click here to buy. The F&D A110 2.1 Channel Multimedia speakers are said to deliver 3000W PMPO, while the wooden cabinet reduces sound distortion. The device can be connected to your TV, PC, smartphone or an MP3 player. Click here to buy. The Bose SoundLink Mini II wireless Bluetooth speakers have received a hefty price cut and can now be purchased at Rs 12,960, down from Rs 16,200. The speaker is said to deliver up to 10 hours of audio playback on a single charge. The Bluetooth speaker has a rated range of 30 feet and also comes with an aux port. Click here to buy. The Bose Sound Link Micro speaker is Bluetooth enabled and is also rated IPx6 water-proof. The company says that the device can deliver up to 6 hours of playback when fully charged and has a wireless range of up to 30 feet. One can also receive calls on the device and access Siri or Google assistant.Click here to buy. The SoundBot SB571 speaker features two 6W 40mm speaker drivers. It comes with Bluetooth 3.0 audio connectivity and offers 12 hours of audio playback. It is compatible with both Android and iOS devices, and comes with an aux port as well. It is equipped with a 2000mAh rechargeable battery. Click here to buy. The JBL soundbar has received a 19 percent discount and it comes with a dual bass port design. The device can wirelessly stream music with Bluetooth but also supports HDMI connectivity. It sports 20W audio wattage and weighs 1.4Kg.Click here to buy. Amazon is offering the Boat Stone 200 portable speaker for Rs 999, down from its MRP of Rs 2,990. The speaker is water-proof and shock-proof. It comes with Bluetooth 4.1 connectivity and is said to operate over a range of 30 feet. The 3W speaker also comes with an aux port and a built-in microphone for handling calls. It is backed by a 1500mAh battery, which can be charged using a micro-USB cable.Click here to buy.